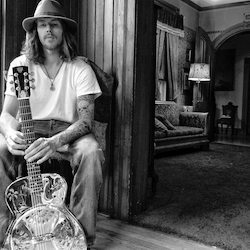 With a spirit and sound recalling the halcyon days of BOB DYLAN and ARLO GUTHRIE, Madison guitarist and vocalist TEDDY DAVENPORT is playing earnest honest-to-goodness classic acoustic American Folk music. His new EP is called Middle of A Miracle and he’ll be releasing it at Door Creek Church on December 12th supported by Krause Family Band, Madison Malone, and Tyler Preston. We took a minute to talk to him about his new release, his inspirations and the upcoming show. MI: What got you into music and what kind of artists were you into? TD: I always saw myself playing guitar and singing songs. I went through many different phases growing up, traditional country music was the first. GEORGE JONES, DWIGHT YOAKAM, HANK WILLIAMS, and JOHNNY CASH. When I got a little older I stuck on BOB DYLAN and THE BEATLES for a while. I still am, but I was digging pretty deep into those guys growing up. MI: And what exactly was it about folk music that attracted you? TD: I love folk music because I think it’s capable of pulling you in right away. It blends many genres together which make it interesting. Folk music can take you way up, hang out in the middle, and take you way down. There are so many stories that are told through folk music, that’s why it’s fore me. I feel that I have a great story to tell. MI: What’s that story? TD: I lived a selfish life for quite some time. I had a long battle with drugs and alcohol and ended up burning a lot of bridges. Living that lifestyle is terrible, doing pretty much anything to take care of myself. This song is about that, but it’s done in a fun way that makes you wanna listen to it. I can’t say it’s a song that I reached way down in my soul to to write. But it’s a song that tells you a a bit of my story in a fun light way. It gets a really good response at my shows. MI: Was there any kind of theme to the release, a through line that you can point out? TD: Each song started with myself and my acoustic guitar, they can all stand alone with just that. A lot of very talented artists came and added beautiful parts to spice the album up and I’m so grateful for that. I just made a point to be able to perform all these songs at my solo shows, I think that’s really important. I don’t ever want to write a song that I can’t play live. It’s what gives the album a strong foundation. A lot of my writing is about struggle, sin, love, and hope. I do get outside of that, but I see those being a common theme. I write music to help as many people as I possibly can. MI: What’s the release party going to be like? TD: I play a lot of solo shows, but I do play with a band from time to time. I try to have a good mix of energy at my shows to keep people interested and excited to hear what’s next. The overall sound is very important to me because I want the audience to hear everything that’s happening on stage. I sing with a lot of soul, I strive to have every person feel like I’m singing directly to them. You’ll hear where some of my songs come from throughout the show. I take the audience to some pretty dark places of my life, but I will lighten it up one way another. A lot of times making fun of myself. I always shoot to have everyone feeling better than they did before they came to the show. MI: Any last words for the Max Ink readers? TD: I just want to thank everyone that comes to my shows, buys my merchandise, or just says hi on the street. I’m so grateful to have such a supportive fiancée that sticks by me while I’m trying my best to make my music career work, that means the world to me. My family and friends are the best anyone could ever ask for. Please come to the release show because life is all about stories and making memories, the more people doing that with me the better.